The Adirondacks are wired. Not just from the energy drink perspective, rather as it relates to online access and capabilities. Today's photo, taken just a few moments ago from my office window, is evidence. I would not be able to do what I do if I didn't have a screaming connection to the internet here at the homestead. Obviously, the internet and broadband have changed the way we live and do business. I know we all know that. What is very special is the fact that it has opened up the Adirondacks. I wrote a paper on the opportunities of teledevelopment in the Adirondacks back in 1999 when I sometimes got paid to write. It sounds quaint when I read it now, but I think it still rings true. "The application of information technologies in North Country businesses, schools, health care and government agencies can make these institutions more efficient and effective, thus overcoming the "rural penalty" of geographic distance and isolation." I know I take it for granted now, but we really have achieved the goal of 'geography doesn't matter.' You can do; make, create, advise, almost anything here in the Adirondacks because geography no longer matters! We have great access to all the latest technologies and resources a business or entrepreneur could need or want. The ability to live, full- or part-time in a paradise like the Adirondacks and have a satisfying professional life is priceless. 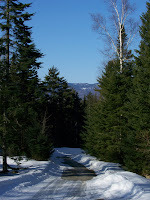 And I can't resist a little update on the spring ski conditions in the Adirondacks. Amazing, but hard and fast. Mount Van Hoevenberg has plenty of snow, it was just a little hard last evening after the torrential rain and subsequent single digit temps. It should soften up nicely today. Corn snow!